B2F or Back to The Future, a unique 10-piece Dutch swing band of professional musicians, was back again at the Silverlake on October 15 with their expanded repertoire and tremendous on-stage presence. They delighted and entertained all those in attendance with their set list spanning from the early forties to the present day, from Frank Sinatra to James Brown, Ricky Martin to Michael Jackson. Pattaya Mail’s Sue K (seated center) poses with the members of B2F. 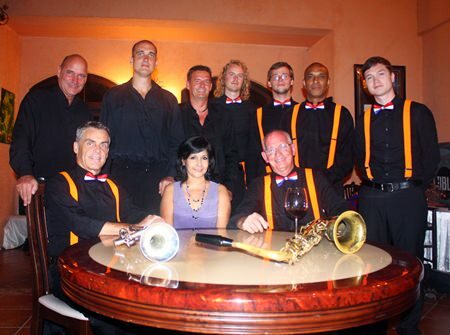 Led by Jos Muijtjen and Paul Van Duyn, this true power band with sensational vocals kept the room on fire with their almost non-stop tempo of swing, standard, Latin, tango, cha cha cha, pop, disco and more. Supported by their extended horn and woodwind sections, they also kept guests more on the dance floor than at their dinner tables. The band members love Thailand and Thai food (among many other things) so don’t worry if you missed them this time around – they’ll be back! 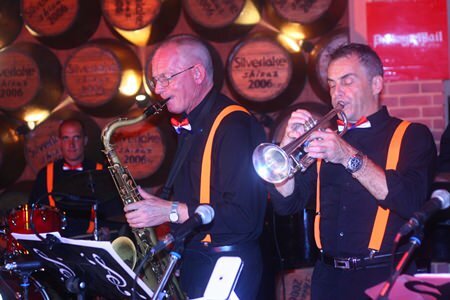 Dutch swing band B2F belt out some crowd favourites at Silverlake. 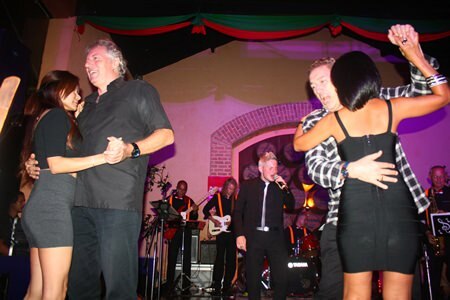 The band kept the venue rocking and the dance floor busy all evening.